Hello boys and girls, how is everyone this blessed morn? *crickets* Yeah, me too! The weather in Cocoa, Florida is a sunny 83 degrees today. Traffic on the 405 is bumper to bumper. Might be a good day to make your coffee a mocha because you might need that extra jolt to keep you awake during the long commute. In the news, a woman is accused of attacking her sister with a toilet lid. You know, the lid on the tank of the toilet. That creatiful thinking right there. That's like the Jackie Chan method of fighting... using the items in your surroundings as weapons. There's one thing I don't get. She's being charged with domestic abuse and assault causing injury and INTERFERENCE WITH OFFICIAL ACTS. What the hell does that even mean? What is an "official act"? Was her sister trying to take a dump? Is that the official act? Cause I'm sure the whole toilet lid thing would interfere with that. In celebrity news, Slash performed at the end of the Tonight Show Tuesday night. And he was wearing the "I'm With Coco" pin on his label. Now I saw Slash not too long ago when I was eating at a restaurant with my family. He was eating with his kids and I must say they were a bit crazy and a little very annoying. But this... this more than makes up for that. Slash, you rock. It would be my pleasure to eat in a booth next to you and your rowdy kids again. I might even offer to pay. 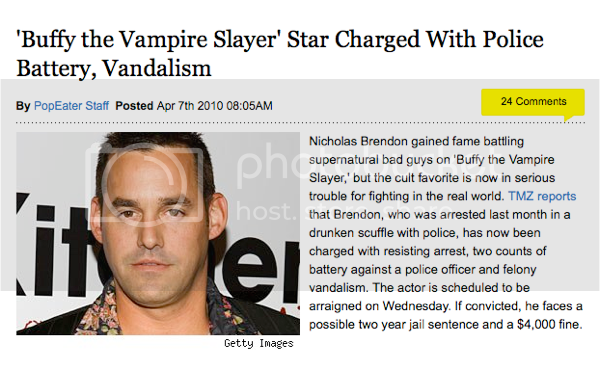 In sad news, Nicholas Brendon, AKA "Xander Harris" from Buffy the Vampire Slayer has been charged with resisting arrest, felony vandalism and two counts of battery against a police officer from his drunken rampage last month. Something is just not right here. My Xander wouldn't do this. I think he was probably under the influence of Dracula. Was he eating spiders? Referring to a mysterious figure as "Master"? Because that would probably explain it. Or maybe it was bunnies. Over 2500 left-handed people a year are killed from using equipment made for right-handed people. I'm surprised you've survived this long, Mom. The odds are not in your favor. Team CoCo for sure!! I love it. We must try to remember that Nicholas Brenden != Xander. Just as Alexander Skaarsgard is not a vampire. And Nathan Fillion is not..um...ok..forget that one but I'm serious about the first two. I am guessing your walking those buns around the park right now ;). Ok! first off UK here, what the heck is Coco and why did they try to ban a coco pop honestly. Hmmm Xander, is it the cute guy from Buffy, doesn't he realise that you only stake the vampires shakes head at Xander. I was going to add something really silly, witty and intelligent but all I can see is taking your goldfish to work day in my head. 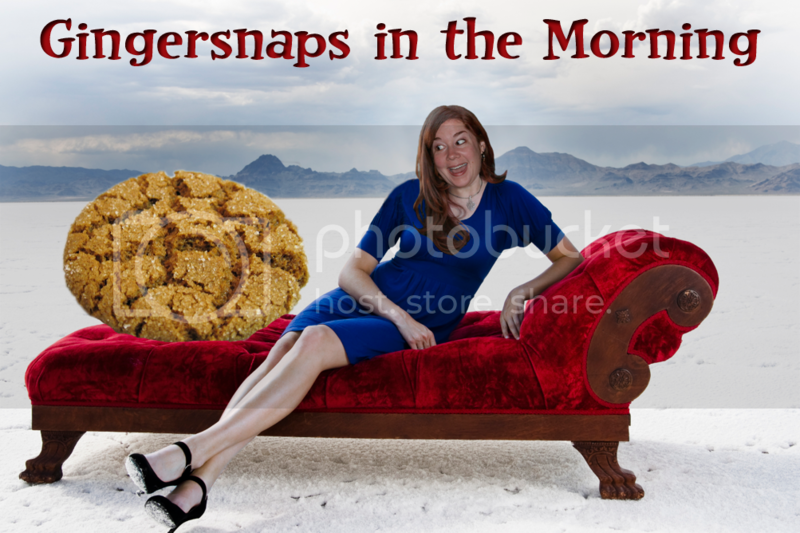 Shuts up and eats a ginger snap he he he. Once again great blog hun. Thanks Andrea! Coco is the nickname for Conan O'Brien. 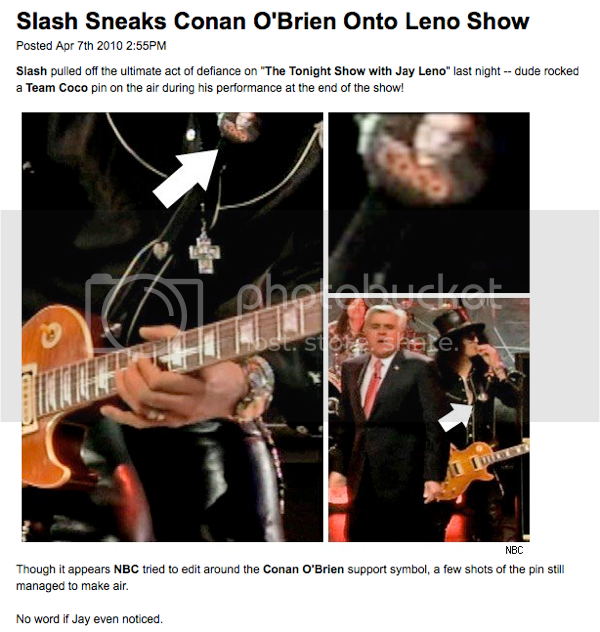 By wearing a Coco pin, Slash was showing Jay Leno that he's taking Conan's side in the Tonight Show battle. What tonight show battle? I'm sooooo confused. 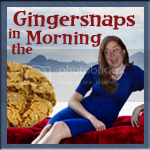 When I saw Ginger's tag on FB about team CoCo..I thought she was talking about Coco whatshername..you know; the um "woman of questionable moral fibre" that Ice-T is currently..um "Dating". OKay! as you can see; Deep is back from his Hiatus. Ginger; thank you for all the love and support you've shown me; know that I love you too. Putting a rabbit on a leash and taking it for a walk? A Flemish Giant of all things? Who would do something like that? 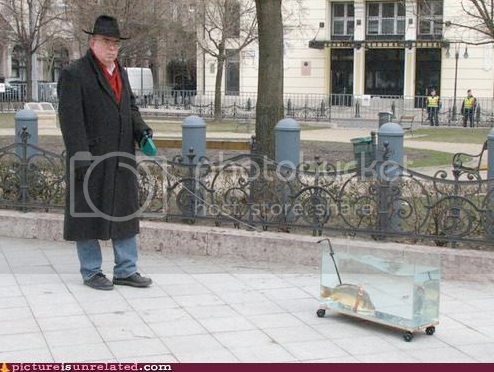 I mean; taking a fish for a walk is one thing; but a bunny? thats just unadulterated craziness. you'd expect that from someone with a menagerie including snakes; cats; rabbits and sundry others; but an upstanding spicy cookie like yourself? @Deep, Not Ice-T's wife Coco. The Ginger Coco! I think you know me a little too well. It's kind of scary. Maybe you should be writing this blog instead of me. ;) Love you.